Sam sets up displays of 105 cans of cat food in his shop in triangular stacks. He puts 14 on the bottom row, 13 on the next one up, 12 on the next and so on... and finally one on top, a stack 14 layers high. How tall would this stack be? Would it be taller than you are? 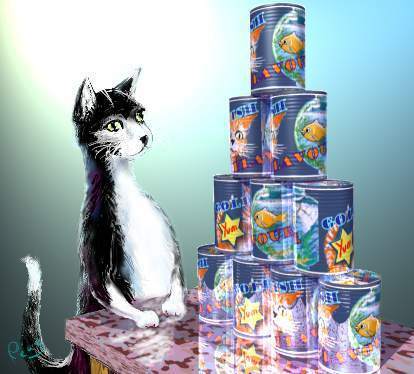 Felix buys 33 cans of cat food so Sam can't make a triangular stack with 14 layers. He stacks all the remaining cans into two identical triangular stacks with one can in the top layer, two in the second layer and so on. How many rows does each stack have? What is the smallest number of cans Felix could have bought leaving exactly the right number for Sam to make two identical triangular stacks? Tom buys 7 cans from a triangular stack with nine rows. Sam re-stacks the remaining cans into two new triangular stacks with different numbers of rows. How many rows do the two new stacks have? Sam finds he can arrange 49 cans into 3 triangular stacks in two different ways. What do you think Sam's solutions were? Are there only two possibilities? Can you find another number which can be split into 3 triangular numbers in more than one way? Make up your own can stacking puzzle. Factors and multiples. Working systematically. Combinations. Trial and improvement. Triangle numbers. Introducing algebra. Addition & subtraction. Investigations. Interactivities. Multiplication & division.